One of the first steps to increasing your driving confidence is to pinpoint when and what about driving is making you stressed, nervous or anxious, by asking yourself a few questions which are below or by watching this short video. Are you generally stressed, nervous or anxious? Is just the thought of driving nerve-wracking? Do you feel the same or similar nerves or anxiety at other times? If a range of situations make you feel stressed or anxious then you might like to look at the techniques suggested for general anxiety. Do you only feel this way when driving or during specific elements such as roundabouts, parking or motorways? Do you only experience these feelings during test situations? If you can pinpoint your feelings to specific situations rather than general situations you may like to start with techniques suggested for specific anxiety. Think about your experience of stress, nerves or anxiety, what happens? How would you describe it to someone else? Do you experience mainly physical symptoms such as sweating, shaking, nausea, increased heart rate and/or breathing, tense muscles and dry mouth? Then you may like to explore techniques that help you to manage a physical stress response. Perhaps your experience is more mental with symptoms such as negative thoughts, fear of failing, worrying about what others will think? In this case, I suggest starting with techniques that help to manage a cognitive stress response. Very often people experience a combination of stress responses so use whichever seems to stand out the strongest for you as a starting point. While some techniques are suggested as most beneficial for certain types of stress there is a crossover effect so any of the techniques will still have a benefit. 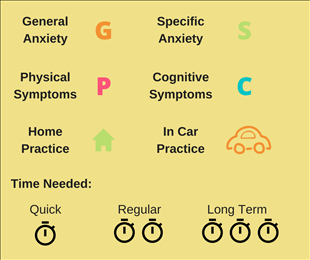 We use this key to help you decide where to start based on your experience of stress, nerves and anxiety and the amount of time you have available. We experience changing feelings as we go about our day ranging from being calm to feelings of nervousness, stress, and anxiety and even panic depending on the situations we find ourselves in. If we perceive that we are unable to cope with a situation we feel stressed. Our immediate stress response often called a fight or flight response is nature’s way of preparing our bodies to respond to danger by either fighting, running away or hiding – none of which you are able to do while driving a car! Depending on our skills in managing stress this might lead to worrying, nervousness, negative thinking and anxiety. If we repeat these patterns of behaviour, again and again, they become habits that are reinforced and strengthened every time we experience them. How does this affect your behaviour and your learning? We have three emotional systems that govern our actions and how we feel. We should move through all three systems throughout the day depending on the situations that we find ourselves in. Soothing System - our soothing system balances our drive and defence systems. It’s about rest and recovery, feeling calm, connected to family and friends, spending more time in 'being' rather than 'doing'. TOP TIP - You have 3 emotional systems that you experience throughout your day depending on the situations you find yourself in. Your Drive system keeps you motivated and is your busy action system, your Defence system is the fight, flight, freeze which is triggered when you feel stressed and your Soothing system is about rest, recovery and feeling calm. Each system affects your thoughts, mood and behaviour so make sure that you keep your 3 systems in balance by learning how to activate your soothing system, spending less time doing, and more time just being. Comfort Zone - we feel calm, what we learn feels easy but possibly has little challenge, is a little boring, learning may be slow but comfy and its easy for learning to get stuck. Stretch Zone - we feel a little more awkward, a bit more challenged but it's manageable, we have to focus more, we learn a lot and get a sense of achievement. The more time we spend in this zone the more it will grow. Past learning slips into the comfort zone and new learning that would once have been in the panic zone is now manageable in the stretch zone as we grow in confidence. Panic Zone - we feel more fearful, possibly frustrated or criticising ourselves and others, it feels too challenging which prevents much learning from taking place and can generate feelings of being scared to try again. Our defence system has been triggered. Failure Zone - feeling overwhelmed, angry or frozen our defence system is in full swing ready to fight, flight or freeze preventing any possibility of learning at all and a complete aversion to repeating the experience. The aim is to stay within our own stretch zone, to recognise if we are approaching our panic zone and triggering our defence systems and then to pause or practise some of the techniques in the confidence toolkit to be able to stay in the stretch zone and maximise our learning capacity. This idea of the stretch zone is used a lot in sports psychology with the theory known as the inverted U hypothesis that an optimum amount of stress or pressure can lead to optimum sports performance. By using the techniques in the confidence toolkit you will be learning to manage your stress and anxiety responses, you will be creating new habits that will be positively reinforced each time you use them. They will take practice at first but will become easier until they become second nature. TOP TIP - You have different zones that you move between when you learn something new. In your comfort zone you feel calm but there is no challenge and you might get bored. In your stretch zone you feel challenged but it's manageable and you feel focused and learn. In your failure zone you feel overwhelmed, angry, frozen and have an aversion to trying again. The more time you spend in the stretch zone, the more it will grow. Past learning slips into the comfort zone and new learning that would once have been in the panic zone is now manageable as you grow in confidence. Now you understand a bit more about how your emotions affect you are you ready to start managing them?